Urban Land Conservancy made our first acquisition in Lakewood with the purchase of the Villas at Wadsworth Station. 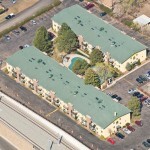 ULC purchased the property in December 2012 with support from the Colorado Division of Housing. This purchase successfully preserved 100 units of workforce housing along transit. Villas at Wadsworth sits adjacent to the Wadsworth Light Rail Station which services RTD’s W line. As a result, the Villas at Wadsworth provide easy access to nearby transit for low-income residents. Overall, this acquisition made the case for Denver’s Transit Oriented Development Fund to expand into a regional acquisition fund. Accordingly, if implemented, the establishment of a regional fund would allow for the additional creation and preservation of affordable housing and other community assets along transit corridors. Earlier this month, ULC completed the rehabilitation of 100 units at our Villas at Wadsworth Station property in Lakewood.